The Bush tax cuts were two tax code changes that President George W. Bush authorized during his term. Congress enacted tax cuts to families in 2001 and investors in 2003. They were supposed to expire at the end of 2010. Instead, Congress extended them for two more years. As a result, they were a major issue in the 2012 presidential campaign. Candidates debated whether Congress should continue them for those making $250,000 or more. The tax cuts were extended permanently as part of the deal to avoid the fiscal cliff. 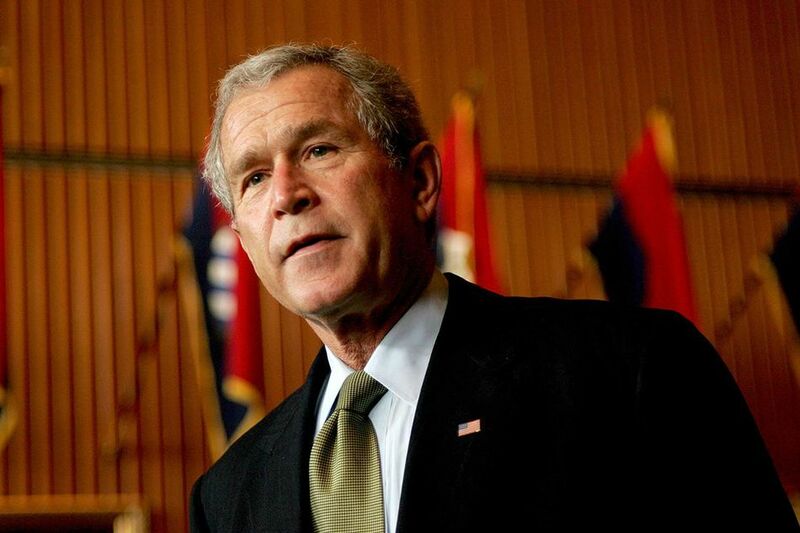 President Bush also authorized the U.S. Treasury to mail out a one-time tax rebate in 2008. It was unsuccessful in preventing the financial crisis. In 2001, President George Bush authorized a tax cut called the Economic Growth and Tax Relief Reconciliation Act of 2001. EGTRRA stimulated the economy during the 2001 recession. It saved taxpayers but increased the U.S. debt by $1.35 trillion over a 10-year period. The Urban Institute said the tax cuts benefited families with children the most. It also helped those with incomes over $200,000. In 2003, President Bush authorized the Jobs and Growth Tax Relief Reconciliation Act. It reduced tax rates on long-term capital gains and dividends to 15 percent. It increased tax deductions for small businesses. JGTRRA also accelerated several provisions in EGTRRA that were taking too long. Congress approved the $168 billion Bush tax rebate in early 2008. Everyone got tax relief on the first $6,000 of taxable income for individuals and the first $12,000 of income for couples. People received a check in the mail. The one-time rebate was a little more than 1 percent of gross domestic product. That should have been enough to boost economic growth by $1.19 for every rebate dollar spent. Unfortunately, by the time the checks went out, Lehman Brothers had collapsed. The bailout of Fannie Mae, Freddie Mac, and the American Investment Group destroyed confidence in the global banking system. It negated any positive effect of the tax rebates by plunging the U.S. economy into five quarters of recession. Frustration over the costs of President Obama's economic stimulus package led to the Republican Tea Party movement. It opposed any tax increases. Obama had pledged to allow the Bush tax cuts to expire for those making more than $200,000 a year. The Tea Party said this would stifle job creation by hurting the small business owners who create 60 percent of all new jobs. The 2010 mid-term elections created a Republican majority in the House. This upset in power meant the Bush tax cuts would be approved by the lame-duck Congress before the year was out. Congress scheduled the Bush tax cuts to expire in 2010 to comply with the Byrd rule. It prohibits any tax law to increase the deficit beyond 10 years. But Congress was faced with an earlier deadline. The IRS had to issue its 2011 tax withholding table by mid-December 2010. That was a mid-term election year. No Congressman wanted to jeopardize re-election by voting against the extension. Congress and President Obama approved a two-year extension, even though the President fought against the extension for wealthier taxpayers. The $858 billion deal cut payroll taxes by 2 percent. It also extended a college tuition tax credit and revived the estate tax. EGTTRA should have expired in 2011. But the economy was struggling to recover from the worst recession since the Great Depression. In 2012, President Obama signed the American Taxpayer Relief Act of 2012. It retained 82 percent of the Bush tax cuts. The Tax Policy Center estimated that the tax cuts raised the after-tax incomes of the top 1 percent of households by 6.7 percent. They only boosted middle class incomes by 2.8 percent. The bottom 20 percent saw their after-tax incomes rise by just 1.0 percent. Research shows no evidence that tax cuts have any impact on the spending habits of upper income taxpayers. The Treasury Department estimated that the Bush tax cuts would only increase growth enough to make up 10 percent of the revenue loss. The Center on Budget and Policy Priorities found that the Bush tax cuts would add $5.6 trillion to deficits from 2001 to 2018. That's about more than 25 percent of the federal debt owed by 2018. Tax cuts are an easy and quick way to stimulate the economy by putting more money directly into taxpayers' hands. Proponents argue that all tax cuts increase consumer spending enough to make up for the revenue loss. That's because consumers and businesses spend enough of the tax cuts to increase demand and create jobs. It creates so much economic growth that tax revenues ultimately rise. The theory doesn't address government spending. But it seems logical that the same effect would occur with an equivalent amount of spending. It would put the same amount of money into the economy. In 1979, economist Arthur Laffer created the Laffer Curve. It is the theory behind supply-side economics. The curve describes how tax cuts affect government revenues. The first is "arithmetic" which creates an immediate loss of tax revenue. The second is "economic" which is longer-term. Over time, consumers will spend their tax savings. This will create more demand and more business growth. Eventually, this will replace the lost revenue. But for the tax cuts to have this impact, taxes before the cuts must be in the "prohibitive range" on the curve. If taxes are already lower than that range, then they will only have the "arithmetic" effect. On December 22, 2017, President Trump signed the Tax Cuts and Jobs Act. It cut individual income tax rates, doubled the standard deduction, and eliminated personal exemptions. Trump's tax plan lowered the top individual tax rate to 37 percent. It cut the corporate tax rate to 21 percent. The corporate cuts are permanent, while the individual changes expire at the end of 2025. The Act increases the deficit by $1 trillion over the next 10 years according to the Joint Committee on Taxation. It will increase growth by 0.7 percent annually, thus reducing some of the revenue loss from the $1.5 trillion in tax cuts. The Trump tax cut occurred while the economy was solidly in the expansion phase of the business cycle. The Bush cuts occurred during the 2001 recession and the years immediately following. Congress was concerned that the recession would worsen without the cuts. Both cuts increased the deficit and debt. How Would the Economy Be Different If Romney Had Won? Do Republican Economic Policies Work?